Make some pretty Christmas lights that you don't have to plug in. This easy Christmas craft from The New Image Group is fun for the kids and an easy Christmas craft to make. 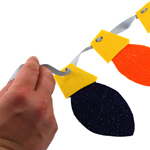 Cut out 4 Bulb Shapes on each 9 x 12 Sheet of Glimmer Felt. Cut out 16 Bulb Bottoms from 9 x 12 Yellow Stick-It Felt Sheet. Mark on your Bulb Bottoms with pencil where the holes will be punched. 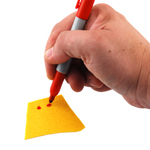 Remove adhesive-backing on Stick-It Felt and affix to bottom of bulb. 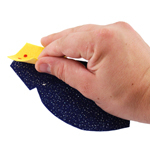 Using the single hole punch, punch holes where you have marked. 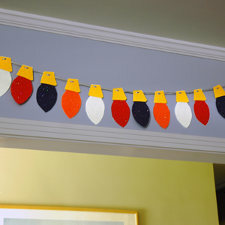 Arrange your garland in alternating colors on a flat surface. Once you have determined your arrangement, begin stringing the bulbs together, tying a bow at both ends. Finished Garland will be about 80" Long. Wonderful idea for the grandchildren.